I have a 2019 2.5i Premium. 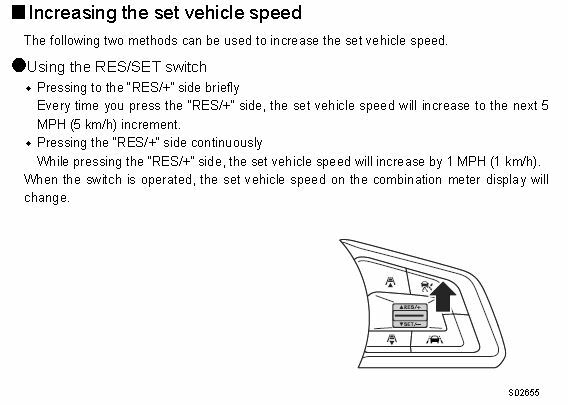 When I am driving with the cruise control set and want to increase the set speed, a press on the RES/+ button increases the speed by 5 mph. That's too much. I would like to increase only 1 mph. Is there any way to adjust that setting? Found that out on this board. Did not know it for 2 months I had the car. lfdal, SubieGrl and ELCID86 like this. These two responses appear to be in disagreement. Guess I'll have to try both, but my wife thinks the tech guy at the dealership said something about press and hold. Seems counterintuitive. We've had ours for about two months but today is the first time I've driven it on an interstate highway. The function of the cruise control switch changed between the 2016 and 2018 models. The 2016 behaves as Zedhead states and I assume that is also the case for the 2017. The 2018 and 2019 behave as Mapdud55 states. Having one of each is an exercise for my memory everytime I switch to driving my wife's 2018. Page 82 of the EyeSight manual explains it. jsgntulok and seagrass like this. For the 2018/19, Mapdude55 is correct. A quick press is +/- 5 MPH, press and hold and you get the 1 MPH increments. One thing I discovered with my 2019 is that the +/-5 MPH quick press will only take you to the next multiple of 5 MPH, not always up or down by exactly 5 MPH. If you have set the Cruise Control to 62 MPH, when you (short) press to increase, it goes up to 65 MPH rather than 67 MPH. If you were going 62 MPH and (short) press down, it only drops to 60 MPH. Only if you are already at a multiple of 5 MPH will the increase or decrease short press give you a 5 MPH increment. The long press will always increase or decrease by 1 MPH. If you press and continue holding, the speed setting will increase or decrease by 1 MPH per second. That's only for MY 2015-2017.